Earlier this month I explored the historic cemeteries of Pescadero. The grass was ankle-high on the Protestant side, but over my knees on the Catholic side. Holes the size of juice glasses riddled the ground, but I never saw a mouse or gopher poke his head out. Where there is prey, however, there will be predators. I kept an eye open for snakes. When I could, I walked on the graves’ curbs and watched my feet in the grass. 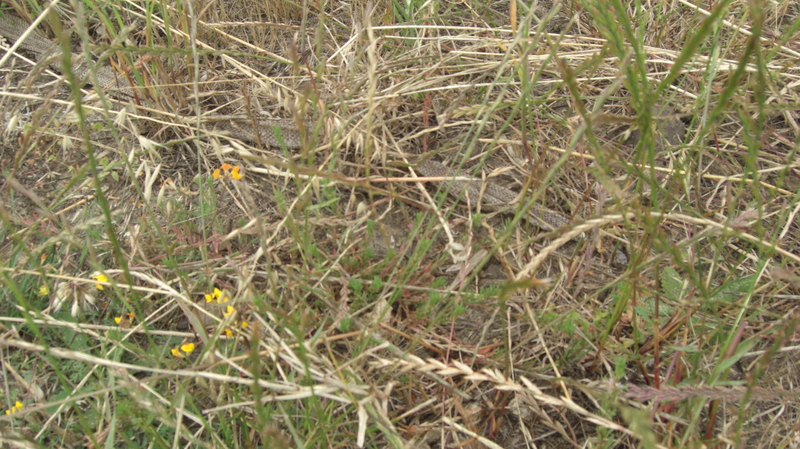 I’d nearly finished my exploration and was headed cross-country down the grassy slope when something caught my eye. In the grass lay the longest snakeskin I’ve ever seen shed in the wild. I should have thrown my notebook down for scale when I took the photo. Trust me, this skin was as long as my leg. It’s hard to see, but there’s a snakeskin in there. It’s the thing that looks like a stick, diagonal across the photo. Which got me thinking: I’ve explored American graveyards from inner-city Detroit to ghost towns in the Sierra Gold Country. 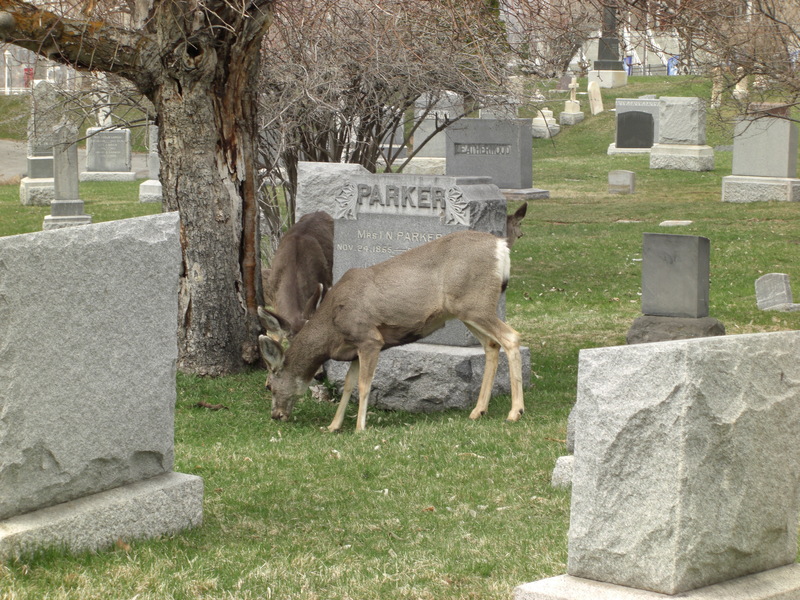 So far I’ve been lucky and nothing dire has happened to me, but it’s time to think about how to keep safe in the cemetery. When dressing for a cemetery excursion, think about where you’re going. If it’s a nice manicured place, dress respectfully. A polite hat and sunscreen are always a good idea. If you’re going further afield, always wear long pants. They’ll protect you from bugs, thorns, and poison oak or ivy. 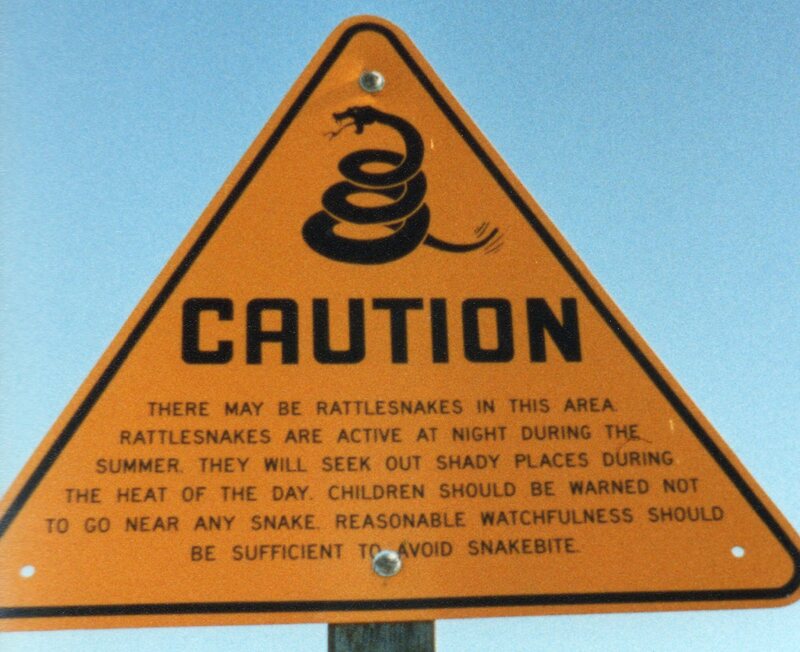 If you expect to meet snakes, wear boots that protect your ankles. If you can, ask the locals about their graveyard before you go. They’ll know if it’s not safe to walk alone in St. Louis #1 or if you have to watch out for pickpockets in St. Peter’s. They’ll tell you if there’s been a mountain lion in the area or if it’s fire ant season. Always let someone know where you’re going and when to expect you back. Lock anything you can’t afford to lose in the trunk of your car. A fully charged cell phone is a smart thing to carry with you, but many cemeteries — especially those off the beaten track — get no reception. Keep aware of your surroundings so you won’t need your phone. In case of emergency, I wear a RoadID bracelet that warns EMTs of the medications I’m on and also lists my contact numbers. You can get your own bracelet here. Be wary of wildlife. Deer look sweet in Disney movies, but they are actually big, nervous creatures. If they feel threatened, they will go through you to escape. Never get between an animal and its exit, even if that animal is only a raccoon. Pay attention to the signs of heatstroke. If you feel lightheaded or your skin begins to feel clammy, pour water over your clothing and move to the coolest place you can, either the shade, a chapel, or an air-conditioned car. Always take more water along that you think you will want to drink. You can’t count on water in cemeteries being potable. You will want to familiarize yourself with how to recognize poison oak, poison ivy, and poison sumac, depending what grows in your area. If you stumble into some by mistake, wash your exposed skin with soap as soon as possible. Mosquitoes aren’t a worry in desert graveyards, but if the grounds crew has been watering or rainwater may be standing in urns, birdbaths, or statuary, mosquitoes can breed. You can avoid them in the heat of the day, but if you prefer more dramatic lighting for your photos, wear something to ward off the bugs. West Nile virus is no fun. Anywhere that there are deer, there can be ticks. If you’ll be poking around long grass, you should wear light-colored clothing and long light-colored socks. Before you get in the car, check yourself over for moving black spots. Ticks can ride around on you for hours before they embed their heads under your skin. Lyme disease is also no fun. Walking stick, for poking around underbrush and avoiding holes, as well as not stumbling over fallen tombstones. First Aid Kit, including painkillers & band-aids and a sting stick, in case you’re stung by a bee. Wasp spray. The internet continues to debate whether this can also double as defense spray. Since the key ingredient in many of these sprays is not tested on humans or animals, it may not be effective as a deterrent. Defense spray, like pepper spray or mace. I’ve read several stories of adventurers being attacked by wild dogs in abandoned cemeteries. Other people mentioned wild hogs in Florida or bears in Tennessee. Out here in California, we have to worry about mountain lions. I haven’t seen any good evidence that mace would deter a puma attack. Maybe a baseball bat makes a good walking stick? Somebody recommended a shovel as a defensive weapon. Clear nail polish for chiggers. Unfortunately, it doesn’t really work on ticks. They just hold their breath. A shaker of ground cinnamon: if you dust your shoes with it, ants won’t bother you. PowerBars or equivalent, to fend off low blood sugar. Hand-held clippers or a good strong pocket knife, in case you get tangled in something. A flashlight with fresh batteries, if there’s any chance you’ll get caught in the dark. I had no idea cemetery exploration could be so risky. As I said, I’ve poked around hundreds of graveyards and the only negative experience I’ve ever had came from security guards who were driving way too fast. Just be smart and keep safe! ETA: A Grave Interest has some good points about visiting cemeteries, too. This entry was posted in Cemetery how-to and tagged Bay Area cemeteries, California cemeteries, Gold Rush cemetery, pioneer cemeteries, wildlife. Bookmark the permalink. Shoot! Now you’ve worried me. That said, I fell into a collapsed grave recently – Ouch! I hope you’re okay! I haven’t managed to fall in to anything yet, but I’ve tripped over plenty. When you’re walking through a cemetery with tall grass always watch out for unmarked,sunken graves.A twisted or broken ankle is no fun. Important safety tip! Thanks for adding that, Timothy. Do people plant poison sumac by graves. I was amazed how much sumac was growing around grave stones in one section of Marion Cemetery (Alabama). That’s a good question. I don’t think anyone plants it on purpose, but animals might help spread it around. I’m not really familiar with poison sumac, but poison ivy spreads via seeds in animal droppings. That’s a good point about the tetanus shot! Here’s something I didn’t consider: coyote attacks. A coyote grabbed a toddler in Forest Lawn in Cypress, CA. Believe it or not, I’m still fiddling with my speech for the Death Salon. I’ve got way too much information to fit into my allotted time. While I stress over that, here is one of my favorite cemetery essays from 2011. Not bad advice, however this person has not explored cemeteries in the Sourh. Cinnamon doesn’t work with fire ants. For rural unkempt cemeteries, I only explore them in the winter months—lessens the snake problems (we have 4 varieties of rattlesnakes alone in SC). If exploring in the South in rural unkempt areas in warm months you need to wear snake boots. I would also suggest wearing bug repellent because the mosquitos and no-see-ums will devour you. You also have to watch out for yellow jackets much more than wasps. And forget the deer, I’ve had a lot more problems with wild hogs.